CBS Scene will offer a complimentary lunch special for veterans and active military on Monday, Nov. 11. In recognition of Veterans Day on Monday, Nov. 11, The Hall at Patriot Place presented by Raytheon will be offering free admission to veterans and active military over Veterans Day weekend. From Saturday, Nov. 9 through Monday, Nov. 11, veterans and active military with proper military identification are invited to enjoy a free visit to The Hall, where they will experience the tradition of the New England Patriots and explore the history of football in New England in a one-of-a-kind, cutting-edge sports and education facility. On Monday, Nov. 11, veterans and active military can complement their trip to The Hall with a visit to CBS Scene at Patriot Place, which will offer a complimentary special off the lunch menu with a military ID. The Hall is open Saturday from 10 a.m. to 9 p.m., Sunday from 10 a.m. to 7 p.m. and Monday from 10 a.m. to 5 p.m. Since opening in September 2008, The Hall has offered free admission to military personnel each Veterans Day and Memorial Day. Military personnel were also offered free admission in 2010 during an extension of the traveling exhibit “Pro Football and the American Spirit,” which told the story of professional football players and personnel who served in the military from WWII to Desert Storm and the conflict in Afghanistan. On Nov. 24, The Kraft family and New England Patriots will honor veterans at Gillette Stadium prior to the Patriots’ Week 12 tilt with the Denver Broncos on NBC’s “Sunday Night Football.” Kick-off is scheduled for 8:30 p.m. 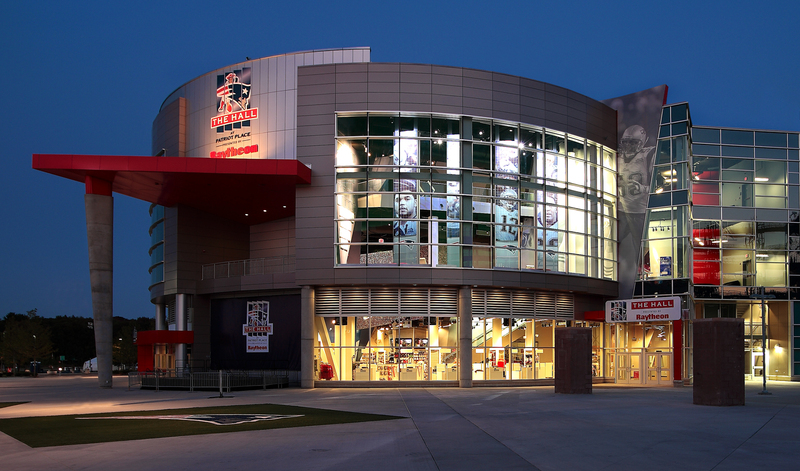 The Hall at Patriot Place presented by Raytheon is the crown jewel of Patriot Place and the only sports and education experience of its kind. Through dazzling array of interactive multimedia exhibits and artifacts never before viewable by the public, The Hall showcases the tradition of the New England Patriots, explores the history of football in New England, and promotes math and science education for thousands of schoolchildren each year. The Hall received a Gold MUSE Award from the American Association of Museums and The Hall’s signature film, “Patriots Way,” won a CINE Golden Eagle Award. The Hall was named to Boston Globe Magazine’s Best of the New, and was a Yankee magazine Editor’s Choice recommendation. Tickets to The Hall are $10 for adults, $7 for seniors and $5 for children 5-12. Children 4 and under are admitted for free. The current hours of operation are 10 a.m. to 5 p.m. from Monday to Friday, 10 a.m. to 9 p.m. on Saturday and 10 a.m. to 7 p.m. on Sunday. For more information or to purchase tickets, please visit TheHallatPatriotPlace.com, visit “The Hall at Patriot Place presented by Raytheon” on Facebook or follow @TheHall on Twitter.